Graph images can now be posted to notification channels・Narrowing down closed alerts etc. Hey! Mackerel sales engineer, id:a-know here. On Thursday of next week, October 20th, yours truly, id:a-know, will take to the podium at the Twilio Business Seminar Vol.31. The title of the seminar is “Implementing operational monitoring solutions with TwilioｘMackerel” and I plan on speaking about the integration of Mackerel and Twilio. There has been so much interest in the event that there’s currently a waiting list to register, but I think there is a possibility that the number of attendee spots will increase, so by all means, apply! Anyways, here is this week’s release information. A camera icon has been added to the upper right-hand corner of every graph. 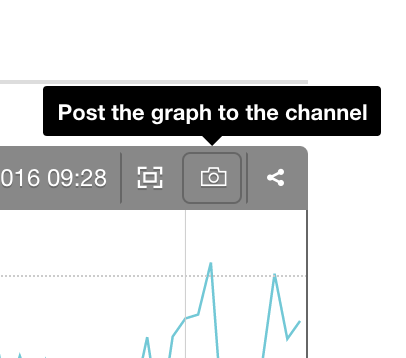 With this button, you can now easily post graph images to notification channels. Please note that this feature is not yet supported for alert graphs, embedded graphs in Dashboards etc., and preview graphs of expression monitoring. Each notification channel can be configured from the Channel Settings. Additionally, the notification channels that are currently supported are Slack, Hipchat, and Typetalk. Check out the following help page as well. We think this will be useful for situations such as “An alert isn’t raised, but I want to discuss the behavior of this graph in chat”. An alert status of (In Progress / Closed) is now a possible choice in the refinement conditions of the alert list screen. Put it in use with looking back on alerts that have already been addressed! Mackerel Meetup #8 next week! We made the announcement last week and it’s already upon us! Mackerel Meetup #8 will be held on Monday next week! Everyone on the Mackerel team, from both Tokyo and Kyoto, is really looking forward to seeing all of you!